Come meet Anna and discover the excellent Rose Mille doublette crepe paper in action as Anna handcrafts crepe paper Roses. 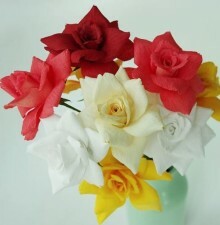 Be inspired by this beautiful past time and high-quality crepe paper for flowers and botanicals. Learn basic techniques for making crepe paper flowers in Anna’s March 16th Crepe paper Flowers: Bouquet of Tulips class.